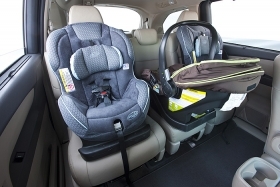 The second row of the Odyssey can be fitted with three child seats but also can pivot outward by two inches so three adults can sit in comfort. Wheelbase 118.1 in. 119.3 in. Length 202.9 in. 200.2 in. Width 79.2 in. 78.2 in. Height 68.4 in. 68.9 in. Curb weight 4,337 lbs. 4,380 lbs. SAN DIEGO -- After a sequence of foul-tip product launches from Honda -- the Insight, CrossTour and CR-Z receiving mixed reviews at best -- getting the Odyssey minivan right was more than just crucial. It was essential. The seven lead engineers and chief designer have owned a total of 27 Odysseys, so they know firsthand what needed to be upgraded or improved. The basics: The redesigned Odyssey is two inches wider, an inch longer, rides lower and is more aerodynamic than its predessor. Under the hood, the Odyssey will have a re-engineered version of its 3.5-liter V-6 engine, with variable cylinder management and an estimated 18/27 fuel economy. As of now, the Odyssey is the only minivan with independent rear suspension. Combined with a more rigid body and subframe structure, that means more sensitive ride control and more precise handling. Honda made the brakes one inch larger in diameter, leading to claims of best-in-class stopping distances. In addition to performance and features, Honda also made the vehicle more stylish, with a signature lightning-bolt beltline. Honda says the vehicle will get five-star safety ratings in all measurements. Notable features: The center console between the two front seats can hold a purse and is removable. Underneath the instrument panel is a “coolbox” that can hold a six-pack of soda and which bleeds air after the evaporator, keeping items cold much longer than typical duct-fed coolers. As for seating, the second row can be fitted with three child seats but also can pivot outward by two inches so three adults can sit in comfort. With six inches more legroom than the Toyota Sienna, the Odyssey's third row has enough space for three full-sized adults -- and with seats that also recline. The cantilevered foldaway function for the third-row seats is now performed with a single strap pull. With the seats removed, the Odyssey can accommodate a 4-by-8 sheet of plywood, three mountain bikes or 10-foot 2-by-4 studs. The entertainment system features a 16-inch hi-definition monitor with split-screen capability for kids quarrelling in the second row. The “song by voice” telematics system replicates the iPod operating system. Compromises and shortcomings: The slide rail for the second-row doors mars the sheet metal, but incorporating it into the beltline would have meant unacceptably crimping four inches of shoulder room in the third-row seats. The third-row windows do not pop open for venting. The base Odyssey has a five-speed automatic; higher trim levels get a more costly six-speed box. All-wheel drive will not be offered. Officials expressed doubts that a hybrid version will be added. The market: The minivan segment is off 50 percent compared with the boom years. But unlike other segments, minivans may not be coming back to pre-recession numbers. Pricing was not available at press time. The skinny: Although down on power compared to the Sienna's V-6, the Odyssey feels more nimble and accurate. The improvement in interior features, fitments and tactile surfaces means the segment has a new mark to shoot for. Honda nailed this one.